High above the Patch that I know and love so well something is amiss. That pesky jetstream that we are hearing so much about at the moment is driving storm after storm in off the Atlantic to batter the Patch. But not on this occasion. This day there was a moment of calm between the storms, relief from the gales and rain that have forced me from the shore more times than I care to mention. After a magical dawn excursion to Thurstaston Shore few days ago and a great edition of Matt & Johnny’s Festive Walk, I had been keen for more festive sunrise Patch action. So, in the limbo between Christmas and New Year (Chrimbo-limbo? ), I decided an early morning walk to Hilbre was in order and I managed to persuade an initially reluctant @loisthomas2 to tag along too. Preparations had begun the previous evening; a big pan of curry-powder-heavy kedgeree was cooked up to be re-heated prior to setting off. Lois pulled on new wellies and I donned my new fleece lined combat jacket and we loaded our Kedgeree into one thermos, coffee into another. Totally ignoring the 3 hour rule for crossing to the island we set off at the edge of the receding tide, commanding it to hurry out like we were King Canute. We were following it slowly out to, then around the back of, Little Eye. 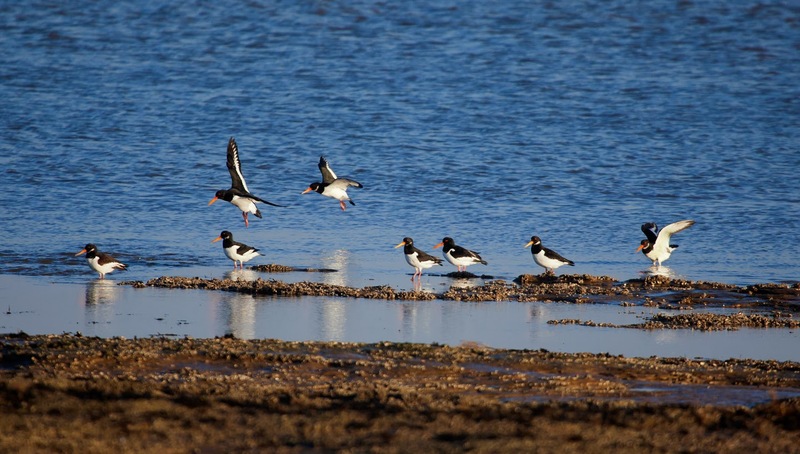 We walked stealthily past a roost of mixed waders on the sands, careful not to disturb them. Save for an enthusiastic dog walker on the marine lake wall we were the only people out. It was very early and savagely cold. The sun was shiiiiiiining. It started a steady climb into a cloudless sky, dazzling yellow looking into it and casting an orange glow on everything it illuminated. We were pioneers of the day, we felt like explorers discovering these deserted islands for the first time, ready to claim them as our own. The wind whipped the waves on to the rocks leading to Middle Eye. 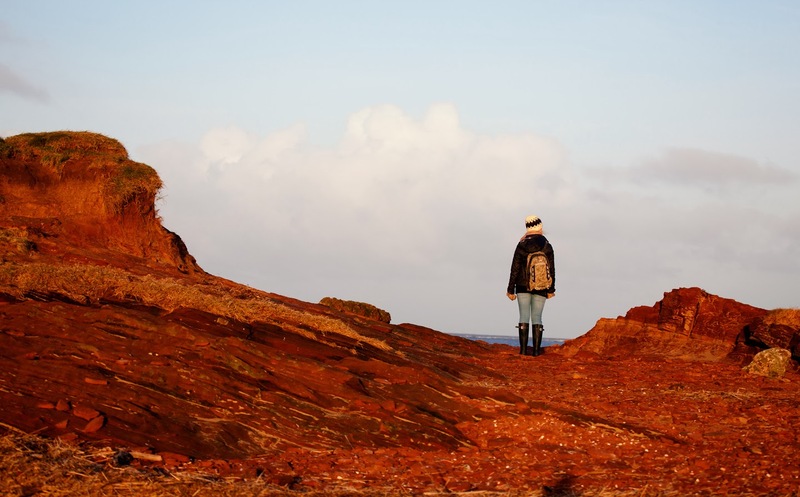 At a snail’s pace we approached the second island in the Hilbre Archipelago as the tide drained from the shore. Some of the roosting Knot woke up and departed to feed on the tide edge at Hoylake. 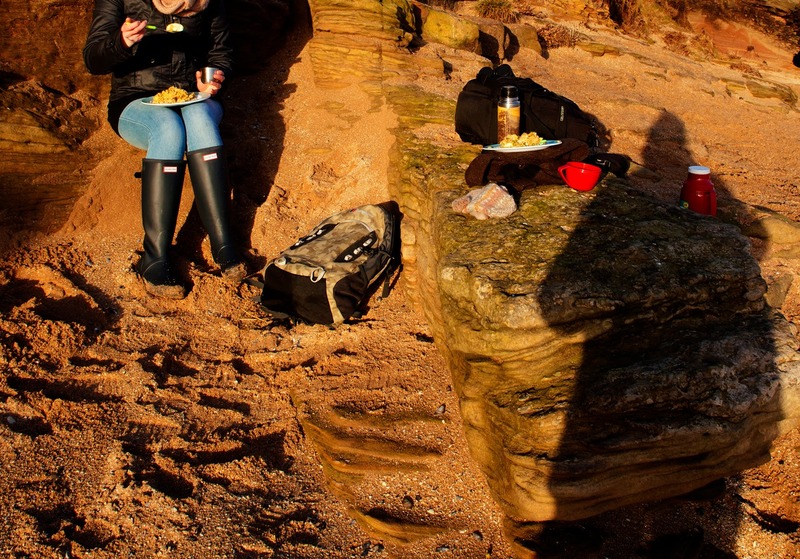 We got to the sandy cove at the south end of Middle Eye with the sun not much higher than the rooftops of West Kirby and in the shelter of the sandstone mini cliffs we felt the first weak warmth of its rays. A Sanderling zipped past then a much slower Heron flapped by. 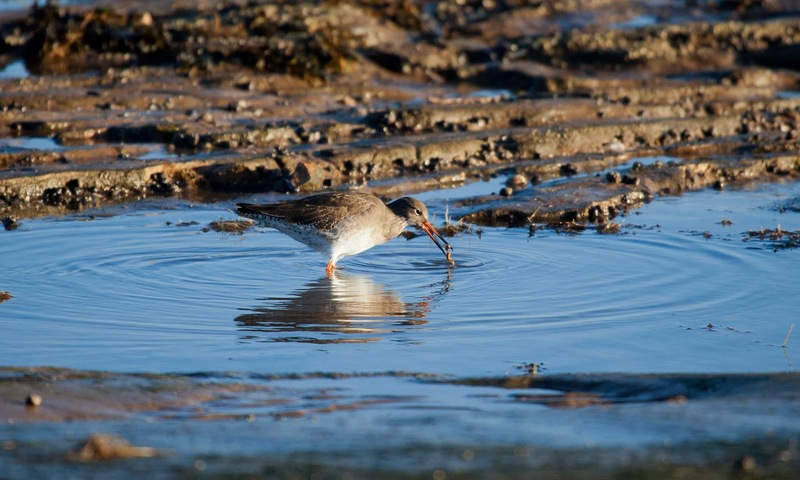 In the seaweed covering the rocks and fringing the rock pools we noticed Turnstones and Redshanks looking for their breakfast. Ah, breakfast! Cold hands fumbled with flask tops and soon the cups were steaming with hot coffee and a generous dollop of kedgeree flopped out of the thermos on to our plastic picnic plates. It was all very Christmasy, a real highlight of our holiday season. We tucked in; looking up from our plates we saw it was just us and the birds, all enjoying a fishy first meal of the day. 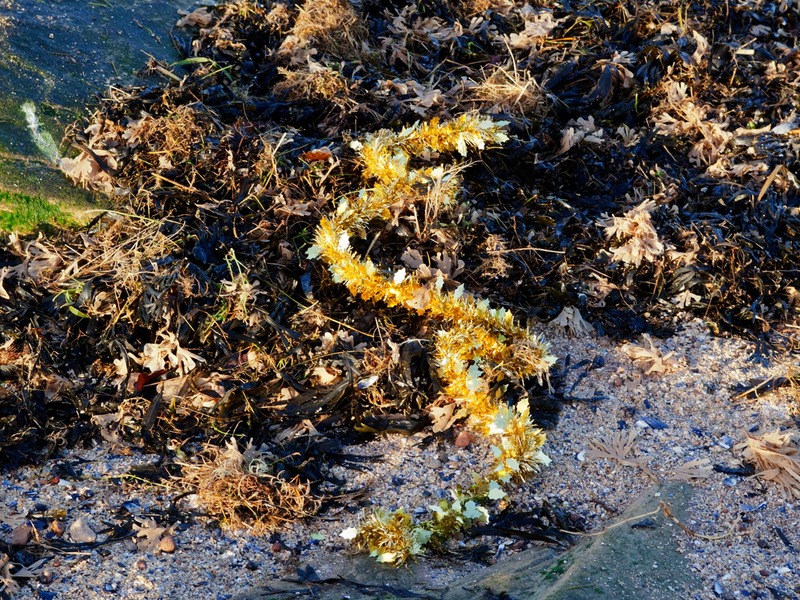 In the tide wrack away to our left a piece of golden tinsel had been washed up. Even the litter was festive. Sat on our stony thrones munching our breakfast we felt like the King and Queen of our newly claimed sceptered isles. We soon realised that we should’ve had no such delusions of grandeur. 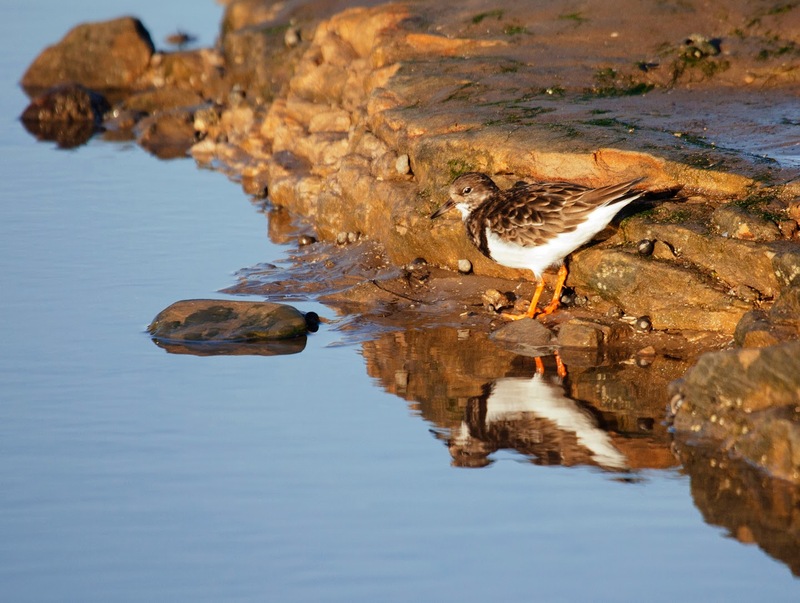 Watching the waders pick about the rockpools and stride across the seaweed it dawned upon us that they were the real kings and queens of Hilbre and we were guests in their realm. We watched a while longer as we digested our meal before returning to the mainland to leave them to their kingdom.